Now that my secret is out, I am excited to share my studio test session with you andddd a little “community” talk, so be sure to stick around until the end. I told you in my last post that I went back and forth for the longest time on doing a studio or not, so I finally decided to just do a session so I could decide one way or the other. If I’m being honest, part of me was doing the session to confirm that I DID NOT want to do a studio. Welllll five minutes into photographing my friend Caitlin (more about her in a bit) and her little guy, I knew there was no going back. Jokes on me now! While I am keeping it real, this little test session of mine is brought to you (#notsponsored) by an air mattress bed and this guys favorite wood toys! I have to say, I am pretty obsessed with the simplicity and it goes to show that sometimes less truly is more. I will be bringing in some new furniture and simple pieces, but for the most part, what you see is what you can expect for your session! Timing was pretty perfect for this studio session too. Little man just turned ONE, so having him be my model for a one year milestone session seemed fitting. He reminded me so much of my little guy at this age and darn it, I miss those days! It’s true what they say, “the days are long, but the years are short.” Some days I wonder how we made it through alive and other days I’m begging to go back and do it all over again! Anyone else? After I shared a few pictures from this session on Instagram and in a motherhood photographers education group, a few people asked me how that worked being friends with someone SO similar in style and that basically lived next door (she doesn’t, but we are close!). My answer? Why not?! 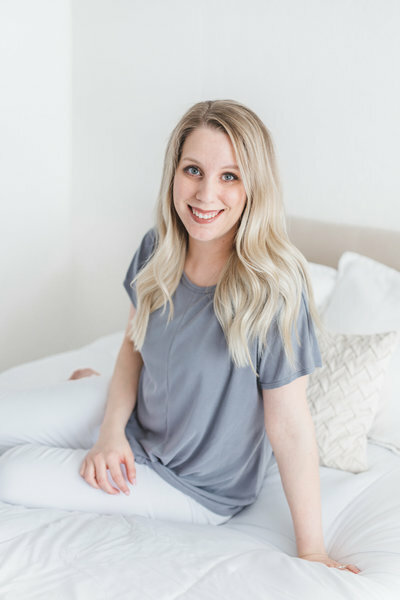 Caitlin is an awesome motherhood photographer and while we are similar, we are also pretty different too! The cool part is we didn’t know we lived so close until we had already become friends through the education group. The community over competition movement has become a buzzword in a lot of ways, but I truly believe in it. I’d rather have a few great friends that understand the crazy, small business world we live in than a few more clients. You with me? So all of that to say, if you are a photographer reading this, I encourage you to make REAL relationships with your peers. It’s not a detriment to your business. They aren’t going to take clients from you. In fact, they may bring your more clients. They may also be the person to encourage you to move forward with a studio or progress in your business. And maybe, they will become a great friend and I’d call that a win! Laura Ryan is a Maternity, Motherhood, Newborn and Family Photographer based out of Charleston, SC and serves Mount Pleasant, West Ashley, Summerville, Daniel Island, and surrounding areas. Laura offers a variety of motherhood sessions, newborn sessions in your home or studio, and family sessions. To reserve your studio session, contact me here! Mama’s dress is sold out, but I’m constantly adding dresses to the my new client closet! Disclaimer: This blog post contains affiliate links and any purchases made through such links will result in a small commission for me (at no extra cost for you).